Your ceiling fan has a broken light pull chain. How do you fix this fast and easy? Ceiling fans with lights have a pull chain to turn the fan or the lights on or off. These pull chains get pulled on daily and can be broken. If you pull too hard on the pull chain the chain can break or come out of its socket. Also, the light switch itself may wear out or fail. If this happens the lights will not turn on. We will show you the easiest way to fix either of these problems below. Since you are working on your ceiling fan, find out the best ceiling fan direction for Summer or Winter. Below are 2 different scenarios, one is a broken pull chain and one is a bad switch. Always turn off power before taking apart a ceiling fan or light switch. The switch housing needs to be removed. Unscrew the screws holding the lighting assembly to the fan. You should now see the light switch and where the pull chain has broken. Unscrew the pull chain assembly from the switch. 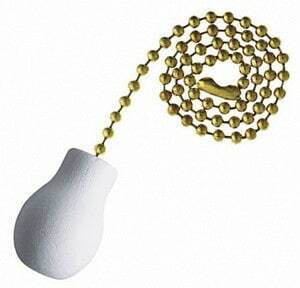 If needed take the pull chain to your nearest hardware store and match it up with a new one. The new pull chain can be installed by screwing it on as the old one was taken off. Put everything back together and test the pull chain. 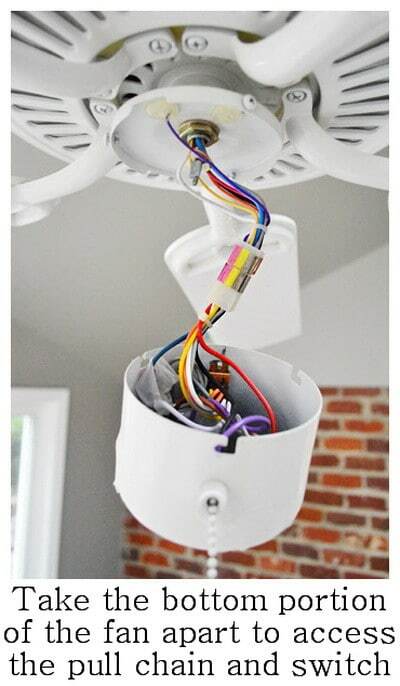 Remove the light fixture housing from the fan. Unscrew the screws where the light fixture attaches to the fan assembly. The small switch where the pull chain attaches should now be visible. If needed take it to your local hardware store and match it with a new one. Install the new switch with the pull chain through the housing and tighten the connection. Both of these repair methods are common solutions to fix pull chains and pull chain switches. Most people can fix this within 30 minutes with just the basic tools on hand. Check that there is a wall switch not turned OFF. If the light fixture is getting power, then the switch is bad or not wired properly. Also be sure the light bulbs are not bad. Recheck all wiring in the light housing fixture. Use a meter to be sure! my ceiling fans old light switch has 2 wires (both black), but was only able to find replacement switches with three wires (black,blue, and red). Can this be used and if so whuich wire goes where? 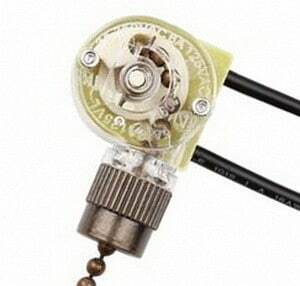 Did you already purchase the 3 wire switch? If not find a switch that matches your old one. We cannot suggest which of the 3 wires on the new switch should go as this can be a hazard if wired wrong. But here is a hint… black, red, and other colors are either always live or carrying current from a switch. So we would wire only the red and black to the existing wiring and cut out the blue wire. But that is only in theory, your switch may be different depending on brand and where it was made. Whatever you decide to do, please use caution. Do you just cut the two black wires and attach to the new switch, or buy a special screwdriver to open up the switch. Would an Allen wrench work? Try to match the new switch wires and wire colors to the one you are replacing. Cut, strip, and replace. We assume you know it is the pull switch that is bad and not the component it controls…. Did the pull switch fall apart or is it still intact but not supplying power? If you can repair it go for it, but a pull switch is relatively inexpensive and can be purchased online for a few bucks. My ceiling fan light will not turn off with the pull chain. I replaced the pull chain unit with a new one and it still will not turn off with the pull chain. What else could be wrong? It is a Hunter ceiling fan. No remote. It turns on and off just fine with the switch. The pull chain for the fan works fine. My ceiling fan light has three wires blue, black, red and l have a two wires switch do l have to get the three wires or can l use the two wires switch can you help. Are you wiring the ceiling fan light fixture to a new switch ON the fan or are you trying to wire the ceiling fan light switch on the wall? Are you wiring the actual light to the fan or the switch on the wall?